At 3 years old, children discover and create. We encourage them to do it all. Our I Can Do It curriculum is designed to inspire children to explore and progress at their own pace. It encourages children to discover their own style as they create opportunities, accomplish tasks and learn new skills. At Kiddie Academy®, children learn throughout the day, including playtime, because the opportunity to learn is always present. 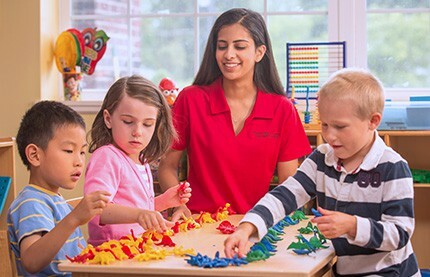 Kiddie Academy understands that it is an exciting and challenging time for children. At this age they are naturally inquisitive, take pride in doing things independently and love to be praised for it! They are learning new words, simple sentences and nonverbal communication, as well as developing and refining gross and fine motor skills. When creating the I Can Do It curriculum, we took all this into consideration. 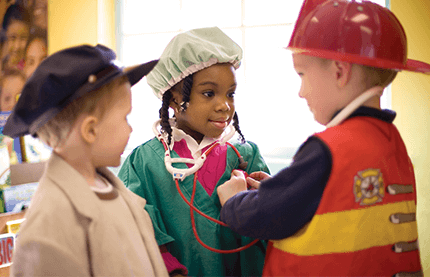 The I Can Do It preschool day care curriculum focuses on your three-year-old child's primary areas of development. 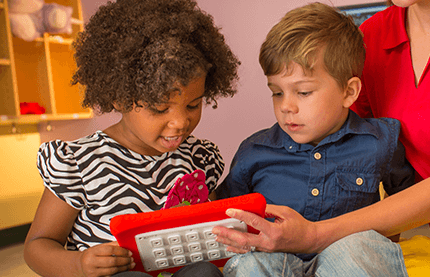 Language Arts and Literacy: Our curriculum includes many opportunities for 3-year-old children to listen to stories, retell them, sing and say simple rhymes. 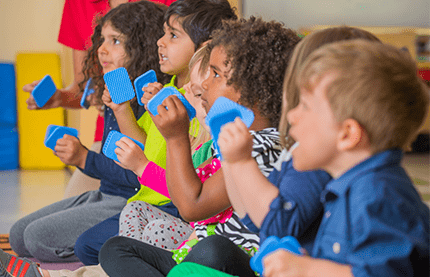 Music & More, powered by Kindermusik, has been incorporated into classrooms and offers a home-based component. Children are encouraged to ask questions, share ideas, explain feelings and talk about what they are doing as they learn. Children begin to recognize print through the learning center signs and begin to identify letters and their names. 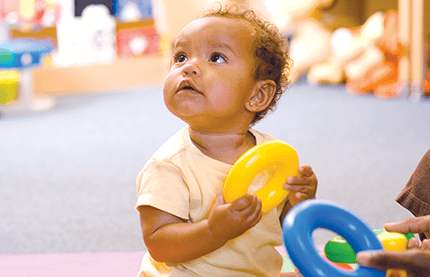 Dramatic Play, Blocks and Transportation and the Library center are a few examples that encourage language development through play. Mathematics: In our curriculum, activities are written to give children the opportunity to sort objects and learn how to sequence items. Children will practice counting beads and blocks, and begin solving simple math problems. Our teachers will also work with the children to identify similarities and differences within a group of objects. Science: At Kiddie Academy, children are given the opportunity to practice observation and problem solving skills. They will be able to observe what happens when a piece of celery is placed in red food coloring. Children will learn about people, plants, animals and weather. Kiddie Academy teachers will also help children recognize the parts of the human body. Social and Emotional Development: Kiddie Academy provides an ideal community atmosphere to learn, play, take turns and share with friends. 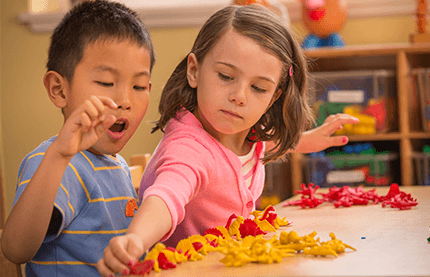 In the learning centers, children have the opportunity to participate in many activities with friends. Kiddie Academy teachers will also be there to help guide children to develop a better sense of self. They model appropriate ways to express emotions so that children will learn how to communicate effectively. 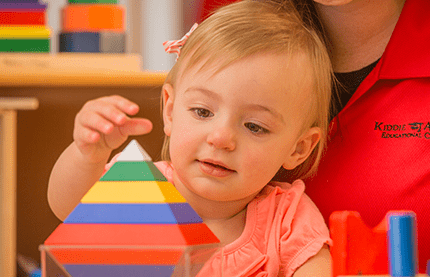 Gross and Fine Motor Development: At Kiddie Academy, there are many opportunities for children to work on gross motor skills. We provide the opportunities to practice walking in a straight line, walking backwards, jumping, throwing, catching, balancing on one foot and hopping. At Kiddie Academy, our teachers will also encourage confidence and support so that children have the motivation to continue to develop new skills. Kiddie Academy teachers also support fine motor development by providing appropriate materials, such as playdough, crayons, markers, puzzles, etc. Children are encouraged to practice scribbling, and some of those scribbles will begin to resemble letters and words. Children are also given the opportunity to feed themselves during our family style meals, zip up or button their coats, and wash and dry their hands independently. 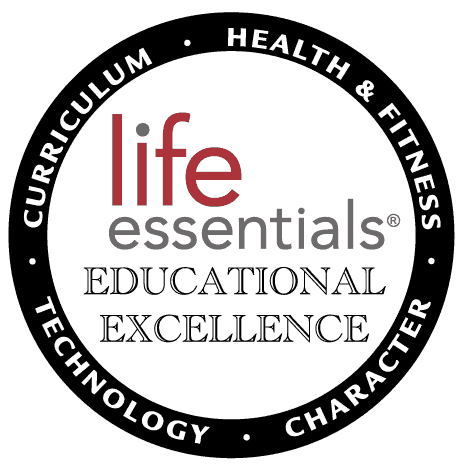 Character Education: Kiddie Academy believes it is important to introduce children to a wide variety of character traits. Each month we focus on a positive value, such as honesty, generosity or patience, to help them better understand the society we live in and to help children develop into caring adults. 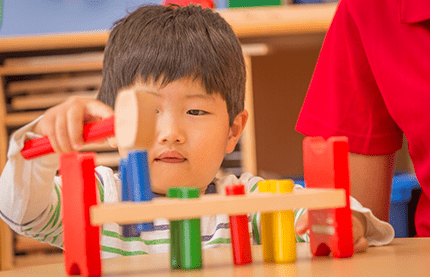 The children will be encouraged to learn about the world around them by using hands-on experiences that promote scientific thinking, analysis and reasoning skills, and creativity. Our curriculum focuses on encouraging children to predict what might happen next, and by exploring and participating in hands-on experiences. Children are invited to ask questions about the STEM experiences, to encourage problem solving and increase vocabulary development. STEM occurs in our Preschool classrooms by allowing the children to play, discover, and explore the natural environments around them.